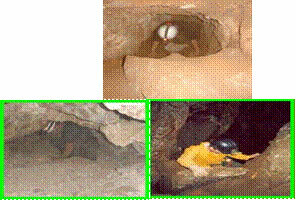 Adventure caving, in the Cradle of Humankind World Heritage Site is an unusual thrill in a unique environment, an opportunity to go underground, get dirty and explore the surreal world of ancient limestone caves. Join us for an incredible adventure, exploring the twists and turns of this natural cave! We kit you out with headlights and helmets, but that's where the pampering ends, it's onto your hands and knees, climbing, clambering, slithering through skinny bits and all of it good fun. This is an adventure suitable for anyone wanting to get out and have fun for a morning, depending on the group; we normally finish at about 12h30. No experience is necessary. Location: In the Cradle of Humankind - Meeting at "Kenjara Lodge" near Sterkfontein, 45 min from Jhb. This adventure is not weather dependant, if a trip is cancelled due unsuitable environmental factors, the trip may be postponed to a future date. Clients arriving more than 15 minutes after the appointed starting time will be treated as a last minute cancellation and forfeit their right to a refund or postponement of the adventure. Up to 50% of the deposit may be refunded if a client or agent cancels the booking up to 4 weeks in advance of the adventure date. Please let us know if anyone booking for this adventure has any condition that may affect their enjoyment during the adventure e.g. recent back or neck injuries, pregnancy, diabetes, epilepsy, asthma, etc. Our adventures are by their nature physical. The onus is on the client or agent to inform us of any condition that may affect the client's enjoyment or well being during the adventure. We supply all the helmets and headlights Adventure guides. We reserve the right to change the adventure as necessary.